This class will take carving step by step, teaching how to use wood carving tools to get the effect desired, no matter what the subject or style. This five day class includes design, tool selection and sharpening, as well as how to break a project down into its basic elements. 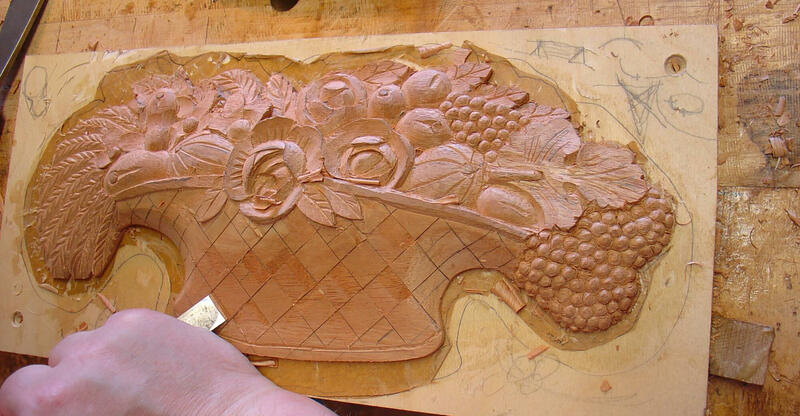 Carving is as much learning how to see as it is dexterity with the tools, and we will cover both aspects of the craft while carving a federal era basket of fruit similar to those found on furniture from Salem, Mass in the early 1800’s. Don’t let your apprehension of carving keep you from making that favorite project! * indicates availability as an intermediate size. I recommend these as they are easier to use and cost less.